It’s tempting to use the ngram viewer to stage semantic contrasts (efficiency vs. pleasure). It can be more useful to explore cases of semantic replacement (liberty vs. freedom). But a third category of comparison, perhaps even more interesting, involves groups of words that parallel each other quite closely as the whole group increases or decreases in prominence. One example that is conveniently easy to visualize involves colors. The trajectories of primary colors parallel each other very closely. They increase in frequency through the nineteenth century, peak in a period between 1900 and 1945, and then decline to a low around 1985, with some signs of recovery. (The recovery is more marked after 2000, but that data may not be reliable yet.) Blue increases most, by a factor of almost three, and green the least, by about 50%. Red and yellow roughly double in frequency. What about technological change? Color photography is really too late to be useful. Maybe synthetic dyes? They start to arrive on the scene in the 1860s, which is also a little late, since the curves really head up around 1840, but it’s conceivable that a consumer culture with a broader range of artefacts brightly differentiated by color might play a role here. If you graph British usage, there’s even an initial peak in the 1860s and 70s that looks plausibly related to the advent of synthetic dye. On the other hand, if this is a technological change, it’s a little surprising that it looks so different in different national traditions. (The French and German corpora may not be reliable yet, but at this point their colors behave altogether differently.) Moreover, a hypothesis about synthetic dyes wouldn’t do much to explain the equally significant decline from the 1950s to the 1980s. Maybe the problem is that we’re only looking at primary colors. Perhaps in the twentieth century a broader range of words for secondary colors proliferated, and subtracted from the frequency of words like red and green? This is a hard hypothesis to test, because there are a lot of different words for color, and you’d need to explore perhaps a hundred before you had a firm answer. But at first glance, it doesn’t seem very helpful, because a lot of words for minor colors exhibit a pattern that closely resembles primary colors. Brown, gray, purple, and pink — the leaders in the graph above — all decline from 1950 to 1980. Even black and white (not graphed here) don’t help very much; they display a similar pattern of increase beginning around 1840 and decrease beginning around 1940, until the 1960s, when the racial meanings of the terms begin to clearly dominate other kinds of variation. At the moment, I think we’re simply looking at a broad transformation of descriptive style that involves a growing insistence on concrete and vivid sensory detail. 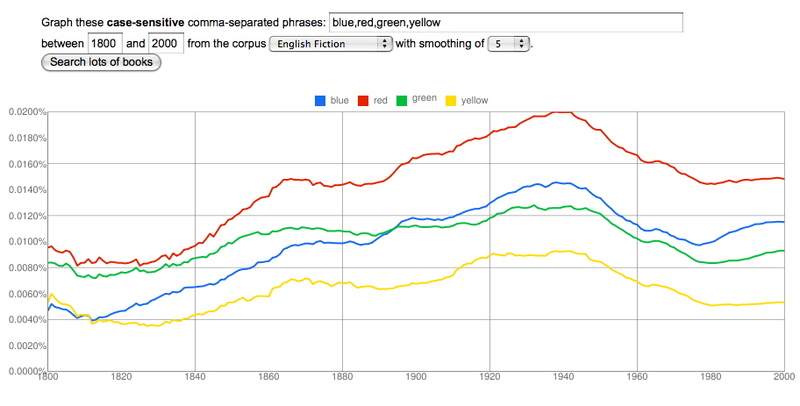 One word for this insistence might be “realism.” We ordinarily apply that word to fiction, of course, and it’s worth noting that the increase in color vocabulary does seem to begin slightly earlier in the corpus of fiction — as early perhaps as the 1820s. But “realism,” “naturalism,” “imagism,” and so on are probably not adequate words for a transformation of diction that covers many different genres and proceeds for more than a century. (It proceeds fairly steadily, although I would really like to understand that plateau from 1860 to 1890.) More work needs to be done to understand this. But the example of color vocabulary already hints, I think, that broadly diachronic studies of diction may turn up literary phenomena that don’t fit easily into literary scholars’ existing grid of periods and genres. We may need to define a few new concepts. 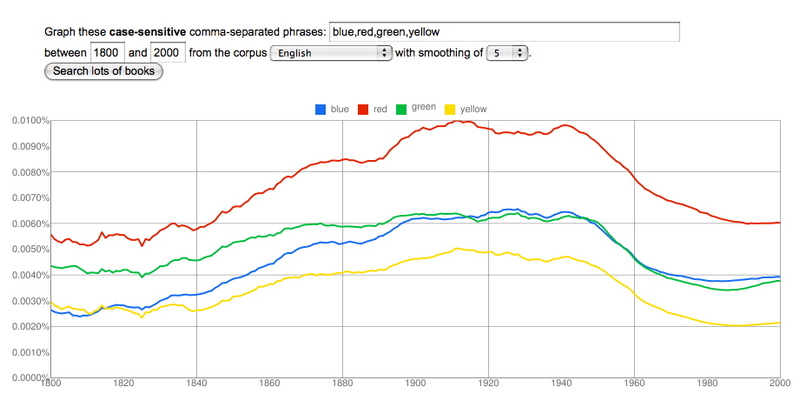 This entry was posted in 19c, 20c, ngrams by tedunderwood. Bookmark the permalink. Re colors, it would be interesting to know what kind of documents you are looking at. Re textiles and garments, however, for centuries there has been a continuous tradition of calling them by complicated names to not only to distinguish different shades, but for fashion reasons. Sometimes these refer to the base color, as in the Elizabethan “goose-turd green” and sometimes not, as in the Elizabethan “dead Spaniard.” Sometimes French or other foreign names were substituted–at times in the 19th century, “rose” sounded classier than “pink.” Victorian fabric manufacturers did labor for names to make the same or similar colors sound new from season to season, as in the late 1860s shade “moon on the desert.” However, they did not invent the idea, by a long shot. And now, we’re typically seeing clothes sold in shades like “celadon” and “sage” rather than just “green.” Unless you know much of this already, the ngrams will do little for you in researching fashion color names. Thanks. The task of proving that secondary color names didn’t take up the slack when primaries decline is going to be even tougher than I imagined. “Dead Spaniard.” Wow. Nicholas Gaskill received his Ph.D. in English and Comparative Literature from the University of North Carolina at Chapel Hill in 2010. His dissertation, “Vibrant Environments: The Feel of Color from the White Whale to the Red Wheelbarrow,” examines the proliferation of color theories and technologies that radically altered the visual landscape of the U.S. at the turn of the twentieth century and argues that writers engaged modern discourses of color to investigate the subtle and often unconscious ways in which we interact with our surroundings. He contends that these literary experiments not only dramatized late-nineteenth-century concerns with how individual subjects emerge from their cultural environments but also fashioned an aesthetic style attuned to the sensory effects of language that opened the door to American modernism. Alongside nineteenth- and early-twentieth-century U.S. literature and culture, Nicholas’s wider interests include pragmatism, the history of science and technology, and the philosophy of Gilles Deleuze; in addition to revising his dissertation for publication, he is also writing a series of essays on the concept of experience in the history of literary criticism. Thanks! I’ll see if I can drop him a line.